and its variants - in particular the variant mapping real rationals with the defining integers below a pinary cutoff to p-adic rationals - was that it defines a continuous map from p-adics to reals and produces beautiful p-adic fractals as a map from reals to p-adics by canonical identification followed by a p-adically smooth map in turn followed by the inverse of the canonical identification. The first drawback was that the map does not commute with symmetries. Second drawback was that the standard canonical identification from reals to p-adics with finite pinary cutoff is two-valued for finite integers. The canonical real images of these transcendentals are also transcendentals. These are however countable whereas p-adic algebraics and transcendentals having by definition a non-periodic pinary expansion are uncountable. Therefore the map from reals to p-adics is single valued for almost all p-adic numbers. On the other hand, p-adic rationals form a dense set of p-adic numbers and define "almost all" for the purposes of numerics! Which argument is heavier? The direct identification of reals and p-adics via common rationals commutes with symmetries in an approximation defined by the pinary cutoff an is used in the canonical identification with pinary cutoff mapping rationals to rationals. Symmetries are of extreme importance in physics. Is it possible to imagine the action of say Poincare transformations commuting with the canonical identification in the sets of p-adic and real transcendentals? This might be the case. Wick rotation is routinely used in quantum field theory to define Minkowskian momentum integrals. One Wick rotates Minkowski space to Euclidian space, performs the integrals, and returns to Minkowskian regime by using the inverse of Wick rotation. The generalization to the p-adic context is highly suggestive. One could map the real Minkowski space to its p-adic counterpart, perform Poincare transformation there, and return back to the real Minkowski space using the inverse of the rational canonical identification. For p-adic transdendentals one would a formal automorph of Poincare group as IPI-1 and this Poincare group could seen as a fractal counterpart of the ordinary Poincare group. Mathematician would regard I as the analog of intertwining operator, which is linear map between Hilbert spaces. This variant of Poincare symmetry would be exact in the transcendental realm since canonical identification is continuous. For rationals this symmetry would fail. For rationals which are constructed as ratios of small enough integers, the rational Poincare symmetry with group elements involving rationals constructed from small enough integers would be an exact symmetry. For both options the use of preferred coordinates, most naturally linear Minkowski coordinates would be essential since canonical identification does not commute with general coordinate transformations. Which of these Poincare symmetries corresponds to the physical Poincare symmetry? The above argument does not make it easy to answer the question. One can however circumvent it. Maybe one could distinguish between rational and transcendental regime in the sense that Poincare group and other symmetries would be realized in different manner in these regimes? Note that the analog of Wick rotation could be used also to define p-adic integrals by mapping the p-adic integration region to real one by some variant of canonical identification continuously, performing the integral in the real context, and mapping the outcome of the integral to p-adic number by canonical identification. Again preferred coordinates are essential and in TGD framework such coordinates are provided by symmetries. This would allow a numerical treatment of the p-adic integral but the map of the resulting rational to p-adic number would be two valued. The difference between the images would be determined by the numerical accuracy when p-adic expansions are used. This method would be a numerical analog of the analytic definition of p-adic integrals by analytic continuation from the intersection of real and p-adic worlds defined by rational values of parameters appearing in the expressions of integrals. For background see the chapter p-Adic numbers and generalization of number concept of "Physics as Generalized Number Theory". Could octonion analyticity solve the field equations of quantum TGD? There are pressing motivations for understanding the preferred extremals of Kähler action. For instance, the conformal invariance of string models naturally generalizes to 4-D invariance defined by quantum Yangian of quantum affine algebra (Kac-Moody type algebra) characterized by two complex coordinates and therefore explaining naturally the effective 2-dimensionality (see this). The problem is however how to assign a complex coordinate with the string world sheet having Minkowskian signature of metric. One can hope that the understanding of preferred extremals could allow to identify two preferred complex coordinates whose existence is also suggested by number theoretical vision giving preferred role for the rational points of partonic 2-surfaces in preferred coordinates. The best one could hope is a general solution of field equations in accordance with the hints that TGD is integrable quantum theory. A lot is is known about properties of preferred extremals and just by trying to integrate all this understanding, one might gain new visions. The problem is that all these arguments are heuristic and rely heavily on physical intuition. The following considerations relate to the space-time regions having Minkowskian signature of the induced metric. The attempt to generalize the construction also to Euclidian regions could be very rewarding. Only a humble attempt to combine various ideas to a more coherent picture is in question. The core observations and visions are following. Hamilton-Jacobi coordinates for M4 (discussed in this chapter) define natural preferred coordinates for Minkowskian space-time sheet and might allow to identify string world sheets for X4 as those for M4. Hamilton-Jacobi coordinates consist of light-like coordinate m and its dual defining local 2-plane M2⊂ M4 and complex transversal complex coordinates (w,w*) for a plane E2x orthogonal to M2x at each point of M4. Clearly, hyper-complex analyticity and complex analyticity are in question. Space-time sheets allow a slicing by string world sheets (partonic 2-surfaces) labelled by partonic 2-surfaces (string world sheets). The quaternionic planes of octonion space containing preferred hyper-complex plane are labelled by CP2, which might be called CP2mod (see this). The identification CP2=CP2mod motivates the notion of M8--M4× CP2 duality (see this). It also inspires a concrete solution ansatz assuming the equivalence of two different identifications of the quaternionic tangent space of the space-time sheet and implying that string world sheets can be regarded as strings in the 6-D coset space G2/SU(3). The group G2 of octonion automorphisms has already earlier appeared in TGD framework. The duality between partonic 2-surfaces and string world sheets in turn suggests that the CP2=CP2mod conditions reduce to string model for partonic 2-surfaces in CP2=SU(3)/U(2). String model in both cases could mean just hypercomplex/complex analyticity for the coordinates of the coset space as functions of hyper-complex/complex coordinate of string world sheet/partonic 2-surface. The considerations of this section lead to a revival of an old very ambitious and very romantic number theoretic idea, which I already thought to be dead. To begin with express octonions in the form o=q1+Iq2, where qi is quaternion and I is an octonionic imaginary unit in the complement of fixed a quaternionic sub-space of octonions. Map the preferred coordinates of H=M4× CP2 to octonionic coordinate, form an arbitrary octonion analytic function having expansion with real Taylor or Laurent coefficients to avoid problems due to non-commutativity and non-associativity. Map the outcome to a point of H to get a map H→ H. This procedure is nothing but a generalization of Wick rotation to get an 8-D generalization of analytic map. Identify the preferred extremals of Kähler action as surfaces obtained by requiring the vanishing of the imaginary part of an octonion analytic function. Partonic 2-surfaces and string world sheets would correspond to commutative sub-manifolds of the space-time surface and of imbedding space and would emerge naturally. The ends of braid strands at partonic 2-surface would naturally correspond to the poles of the octonion analytic functions. This would mean a huge generalization of conformal invariance of string models to octonionic conformal invariance and an exact solution of the field equations of TGD and presumably of quantum TGD itself. I do not bother to type all ten pages here. The interested reader can consult to the chapter Basic Extremals of Kähler Action of "Physics in Many-sheeted Space-time" or to the article An attempt to understand preferred extremals of Kähler action. How to understand transcendental numbers in terms of infinite integers? Santeri Satama made in my blog a very interesting question about transcendental numbers. The reformulation of Santeri's question could be "How can one know that given number defined as a limit of rational number is genuinely algebraic or transcendental?". I answered to the question and since it inspired a long sequence of speculations during my morning walk on the sands of Tullinniemi I decided to expand my hasty answer to a blog posting. The basic outcome was the proposal that by bringing TGD based view about infinity based on infinite primes, integers, and rationals one could regard transcendental numbers as algebraic numbers by allowing genuinely infinite numbers in their definition. In the definition of any transcendental as a limit of algebraic number (root of a polynomial and rational in special case) in which integer n approaches infinity one can replace n with any infinite integer. The transcendental would be an algebraic number in this generalized sense. Among other things this might allow polynomials with degree given by infinite integer if they have finite number of terms. Also mathematics would be generalized number theory, not only physics! Each infinite integer would give a different variant of the transcendental: these variants would have different number theoretic anatomies but with respect to real norm they would be identical. This would extend further the generalization of number concept obtained by allowing all infinite rationals which reduce to units in real sense and would further enrich the infinitely rich number theoretic anatomy of real point and also of space-time point. Space-time point would be the Platonia. One could call this number theoretic Brahman=Atman identity or algebraic holography. 1. How can one know that the real number is transcendental? The difficulty of telling whether given real number defined as a limit of algebraic number boils down to the fact that there is no numerical method for telling whether this kind of number is rational, algebraic, or transcendental. This limitation of numerics would be also a restriction of cognition if p-adic view about it is correct. One can ask several questions. What about infinite-P p-adic numbers: if they make sense could it be possible to cognize also transcendentally? What can we conclude from the very fact that we cognize transcendentals? Transcendentality can be proven for some transcendentals such as π. How this is possible? What distinguishes "knowably transcendentals" like π and e from those, which are able to hide their real number theoretic identity? Certainly for "knowably transcendentals" there must exist some process revealing their transcendental character. How π and e are proven to be transcendental? What in our mathematical cognition makes this possible? First of all one starts from the definitions of these numbers. e can be defined as the limit of the rational number (1+1/n)n and 2π could be defined as the limit for the length of the circumference of a regular n-side polygon and is a limit of an algebraic number since Pythagoras law is involved in calculating the length of the side. The process of proving "knowable transcendentality" would be a demonstration that these numbers cannot be solutions of any polynomial equation. Squaring of circle is not possible because π is transcendental. When I search Wikipedia for squaring of circle I find a link to Weierstrass theorem allowing to prove that π and e are transcendentals. In the formulation of Baker this theorem states the following: If α1,...,αn are distinct algebraic numbers then the numbers eα1,...,eαn are linearly independent over algebraic numbers and therefore transcendentals. One says that the extension Q(eα1,...,eαn) of rationals has transcendence degree n over Q. This is something extremely deep and unfortunately I do not know what is the gist of the proof. In any case the proof defines a procedure of demonstrating "knowable transcendentality" for these numbers. The number of these transcendentals is huge but countable and therefore vanishingly small as compared to the uncountable cardinality of all transcendentals. This theorem allows to prove that π and e are transcendentals. Suppose on the contrary that π is algebraic number. Then also iπ would be algebraic and the previous theorem would imply that eiπ=-1 is transcendental. This is of course a contradiction. Theorem also implies that e is transcendental. But how do we know that eiπ=-1 holds true? Euler deduced this from the connection between exponential and trigonometric functions understood in terms of complex analysis and related number theory. Clearly, rational functions and exponential function and its inverse -logarithm- continued to complex plane are crucial for defining e and π and proving also eiπ=-1. Exponent function and logarithm appear everywhere in mathematics: in group theory for instance. All these considerations suggest that "knowably transcendental" is a very special mathematical property and deserves a careful analysis. What is so special in exponentiation? Why it sends algebraic numbers to "knowably transcendentals". One could try to understand this in terms of exponentiation which for natural numbers has also an interpretation in terms of power set just as product has interpretation in terms of Cartesian product. In Cantor's approach to the notion of infinite ordinals exponentiation is involved besides sum and product. All three binary operations - sum, product, exponent are expressed set theoretically. Product and sum are "algebraic" operations. Exponentiation is "non-algebraic" binary operation defined in terms of power set (set of subsets). For m and n definining the cardinalities of sets X and Y, mn defines the cardinality of the set YX defining the number of functions assigning to each point of Y a point of X. When X is two-element set (bits 0 and 1) the power set is just the set of all subsets of Y which bit 1 assigned to the subset and 0 with its complement. If X has more than two elements one can speak of decompositions of Y to subsets colored with different colors- one color for each point of X. The formation of the power set (or of its analog for the number of colors larger than 2) means going to the next level of abstraction: considering instead of set the set of subsets or studying the set of functions from the set. In the case of Boolean algebras this means formation of statements about statements. This could be regarded as the set theoretic view about transcendence. What is interesting that 2-adic integers would label the elements of the power set of integers (all possible subsets would be allowed, for finite subsets one would obtain just natural numbers) and p-adic numbers the elements in the set formed by coloring integers with p colors. One could thus say that p-adic numbers correspond naturally to the notion of cognition based on power sets and their finite field generalizations. But can one naively transcend the set theoretic exponent function for natural numbers to that defined in complex plane? Could the "knowably transcendental" property of numbers like e and π reduce to the transcendence in this set theoretic sense? It is difficult to tell since this notion of power applies only to integers m,n rather than to a pair of transcendentals e,π. Concretization of eiπ in terms of sets seems impossible: it is very difficult to imagine what sets with cardinality e and π could be. TGD suggests also a different identification of transcendence not expressible as formation of a power set or its generalizations. The notion of infinite primes replaces the set theoretic notion of infinity with purely number theoretic one. The mathematical motivation could be the need to avoid problems like Russell's antinomy. In Cantorian world a given ordinal is identified as the ordered set of all ordinals smaller than it and the set of all ordinals would define an ordinal larger than every ordinal and at the same time member of all ordinals. The physical motivation for infinite primes is that their construction corresponds to a repeated second quantization of an arithmetic supersymmetric quantum field theory such that the many particle states of the previous level become elementary particles of the new level. At the lowest level finite primes label fermionic and bosonic states. Besides free many-particle states also bound states are obtained and correspond at the first level of the hierarchy to genuinely algebraic roots of irreducible polynomials. The allowance of infinite rationals which as real numbers reduce to real units implies that the points of real axes have infinitely rich number theoretical anatomy. Space-time point would become the Platonia. One could speak of number theoretic Brahman=Atman identity or algebraic holography. The great vision is that the World of Classical Worlds has a mathematical representation in terms of the number theoretical anatomy of space-time point. Transcendence in purely number theoretic sense could mean a transition to a higher level in the hierarchy of infinite primes. The scale of new infinity defined as the product of all prime at the previous level of hierarchy would be infinitely larger than the previous one. Quantization would correspond to abstraction and transcendence. This idea inspires some questions. Could infinite integers allow the reduction of transcendentals to algebraic numbers when understood in general enough sense. Could real algebraic numbers be reduced to infinite rationals with finite real values (for complex algebraic numbers this is certainly not the case)? If so, then all real numbers would be rationals identified as ratios of possibly infinite integers and having finite value as real numbers? This turns out to be too strong a statement. The statement that all real numbers can be represented as finite or infinite algebraic numbers looks however sensible and would reduce mathematics to generalized number theory by reducing limiting procedure involved with the transition from rationals to reals to algebraic transcendence. This applies also to p-adic numbers. p-Adic cognition for finite values of prime p does not explain why we have the notions of π and e and more generally, that of transcendental number. Could the replacement of finite-p p-adic number fields with infinite-P p-adic number fields allow us to understand our own mathematical cognition? Could the infinite-P p-adic number fields or at least integers and corresponding space-time sheets make possible mathematical cognition able to deduce analytic formulas in which transcendentals and transcendental functions appear making it possible to leave the extremely restricted realm of numerics and enter the realm of mathematics? Lie group theory would represent a basic example of this transcendental aspect of cognition. Maybe this framework might allow to understand why we can have the notion of transcendental number! The following observations suggests that it could be possible to reduce transcendentals to generalized algebraic numbers in the framework provided by infinite primes. This would mean that not only physics but also mathematics (or at least "physical mathematics") could be seen as generalized number theory. In the definition of any transcendental as an n→ ∞ limit of algebraic number (root of a polynomial and rational in special case), one can replace n with any infinite integer if n appears as an argument of a function having well defined value at this limit. If n appears as the number of summands or factors of product, the replacement does not make sense. For instance, an algebraic number could be defined as a limit of Taylor series by solving the polynomial equation defining it. The replacement of the upper limit of the series with infinite integer does not however make sense. Only transcendentals (and possibly also some algebraic numbers) allowing a representation as n→ ∞ limit with n appearing as argument of expression involving a finite number of terms can have representation as infinite algebraic number. The rule would be simple. Transcendentals or algebraic numbers allowing an identification as infinite algebraic number must correspond to a term of a sequence with a fixed number of terms rather than sum of series or infinite product. Each infinite integer gives a different variant of the transcendental: these variants would have different number theoretic anatomies but with respect to the real norm they would be identical. The heuristic guess is that any genuine algebraic number has an expression as Taylor series obtained by writing the solution of the polynomial equation as Tarylor expansion. If so, algebraic numbers must be introduced in the standard manner and do not allow a representation as infinite rationals. Only transcendentals would allow a representation as infinite rationals or infinite algebraic numbers. The infinite variety of representation in terms of infinite integers would enormously expand the number theoretical anatomy of the real point. Do all transcendentals allow an expression containing a finite number of terms and N appearing as argument? Or is this the defining property of only "knowably transcendentals"? One can consider some examples to illustrate the situation. The transcendental π could be defined as πN=-iN(eiπ/N-1), where eiπ/N is N:th root of unity for infinite integer N and as a real number real unit. In real sense the limit however gives π. There are of course very many definitions of π as limits of algebraic numbers and each gives rise to infinite variety of number theoretic anatomies of π. One can also consider the roots exp(i2π n/N) of the algebraic equation xN=1 for infinite integer N. One might define the roots as limits of Taylor series for the exponent function but it does not make sense to define the limit when the cutoff for the Taylor series approaches some infinite integer. These roots would have similar multiplicative structure as finite roots of unity with pn:th roots with p running over primes defining the generating roots. The presence of Nth roots of unity f or infinite N would further enrich the infinitely rich number theoretic anatomy of real point and therefore of space-time points. There would be infinite variety of Neper numbers identified as eN=(1+1/N)N, N any infinite integer. Their number theoretic anatomies would be different but as real numbers they would be identical. To conclude, the talk about infinite primes might sound weird in the ears of a layman but mathematicians do not lose their peace of mind when they here the word "infinity". The notion of infinity is relative. For instance, infinite integers are completely finite in p-adic sense. One can also imagine completely "real-worldish" realizations for infinite integers (say as states of repeatedly second quantized arithmetic quantum field theory and this realization might provide completely new insights about how to undestand bound states in ordinary QFT). For details and background see the chapter Physics as Generalized Number Theory: Infinite Primes of "Physics as Generalized Number Theory" or to the article How infinite primes relate to other views about mathematical infinity?. The attempt to understand Langlands conjecture in TGD framework (see this) led to a completely unexpected progress in the understanding of the Yangian symmetry expected to be the basic symmetry of quantum TGD (see this) and the following vision suggesting how conformal field theory could be generalized to four-dimensional context is a fruit of this work. The structure of the Yangian algebra is quite intricate and in order to minimize confusion easily caused by my own restricted mathematical skills it is best to try to build a physical interpretation for what Yangian really is and leave the details for the mathematicians. The first thing to notice is that Yangian and quantum affine algebra are two different quantum deformations of a given Lie algebra. Both rely on the notion of R-matrix inducing a swap of braid strands. R-matrix represents the projective representations of the permutation group for braid strands and possible in 2-dimensional case due to the non-commutativity of the first homotopy group for 2-dimensional spaces with punctures. The R-matrix Rq(u,v) depends on complex parameter q and two complex coordinates u,v. In integrable quantum field theories in M2 the coordinates u,v are real numbers having identification as exponentials representing Lorenz boosts. In 2-D integrable conformal field theory the coordinates u,v have interpretation as complex phases representing points of a circle. The assumption that the coordinate parameters are complex numbers is the safest one. For Yangian the R-matrix is rational whereas for quantum affine algebra it is trigonometric. For the Yangian of a linear group quantum deformation parameter can be taken to be equal to one by a suitable rescaling of the generators labelled by integer by a power of the complex quantum deformation parameter q. I do not know whether this true in the general case. For the quantum affine algebra this is not possible and in TGD framework the most interesting values of the deformation parameter correspond to roots of unity. The proposals is t the preferred extremals of Kähler action are involved in an essential manner the slicing of the space-time sheets by partonic 2-surfaces and string world sheets. Also an analogous slicing of Minkowski space is assumed and there are infinite number of this kind of slicings defining what I have called Hamilton-Jaboci coordinates (see this). What is really involved is far from clear. For instance, I do not really understand whether the slicings of the space-time surfaces are purely dynamical or induced by special coordinatizations of the space-time sheets using projections to special kind of sub-manifolds of the imbedding space, or are these two type of slicings equivalent by the very property of being a preferred extremal. Therefore I can represent only what I think I understand about the situation. What is needed is the slicing of space-time sheets by partonic 2-surfaces and string world sheets. The existence of this slicing is assumed for the preferred extremals of Kähler action (see this). Physically the slicing corresponds to an integrable decomposition of the tangent space of space-time surface to 2-D space representing non-physical polarizations and 2-D space representing physical polarizations and has also number theoretical meaning. In zero energy ontology the complex coordinate parameters appearing in the generalized conformal fields should correspond to coordinates of the imbedding space serving also as local coordinates of the space-time surface. Problems seem to be caused by the fact that for string world sheets hyper-complex coordinate is more natural than complex coordinate. Pair of hyper-complex and complex coordinate emerge naturally as Hamilton-Jacobi coordinates for Minkowski space encountered in the attempts to understand the construction of the preferred extremals of Kähler action. Also the condition that the flow lines of conserved isometry currents define global coordinates lead to the to the analog of Hamilton-Jacobi coordinates for space-time sheets (see this). The physical interpretation is in terms of local polarization plane and momentum plane defined by local light-like direction. What is so nice that these coordinates are highly unique and determined dynamically. Is it really necessary to use two complex coordinates in the definition of Yangian-affine conformal fields? Why not to use hyper-complex coordinate for string world sheets? Since the inverse of hyper-complex number does not exist when the hyper-complex number is light-like, hyper-complex coordinate should appear in the expansions for the Yangian generalization of conformal field as positive powers only. Intriguingly, the Yangian algebra is "one half" of the affine algebra so that only positive powers appear in the expansion. Maybe the hyper-complex expansion works and forces Yangian-affine instead of doubly affine structure. The appearance of only positive conformal weights in Yangian sector could also relate to the fact that also in conformal theories this restriction must be made. It seems indeed essential that the space-time coordinates used can be regarded as imbedding space coordinates which can be fixed to a high degree by symmetries: otherwise problems with general coordinate invariance and with number theoretical universality would be encountered. The slicing by partonic 2-surfaces could (but need not) be induced by the slicing of CD by parallel translates of either upper or lower boundary of CD in time direction in the rest frame of CD (time coordinate varying in the direction of the line connecting the tips of CD). These slicings are not global. Upper and lower boundaries of CD would definitely define analogs of different coordinate patches. What the Yangian of quantum affine algebra or more generally, its super counterpart could mean in TGD framework? The key idea is that this algebra would define a generalization of super conformal algebras of super conformal field theories as well as the generalization of super Virasoro algebra. Optimist could hope that the constructions associated with conformal algebras generalize: this includes the representation theory of super conformal and super Virasoro algebras, coset construction, and vertex operator construction in terms of free fields. One could also hope that the classification of extended conformal theories defined in this manner might be possible. The Yangian of a quantum affine algebra is in question. The heuristic idea is that the two R-matrices - trigonometric and rational - are assignable to the swaps defined by space-like braidings associated with the braids at 3-D space-like ends of space-time sheets at light-like boundaries of CD and time like braidings associated with the braids at 3-D light-like surfaces connecting partonic 2-surfaces at opposite light-like boundaries of CD. Electric-magnetic duality and S-duality implied by the strong form of General Coordinate Invariance should be closely related to the presence of two R-matrices. The first guess is that rational R-matrix is assignable with the time-like braidings and trigonometric R-matrix with the space-like braidings. Here one must or course be very cautious. The representation of the collection of Galois groups associated with infinite primes in terms of braided symplectic flows for braid of braids of .... braids implies that there is a hierarchy of swaps: swaps can also exchange braids of ...braids. This would suggest that at the lowest level of the braiding hierarchy the R-matrix associated with a Kac-Moody algebra permutes two braid strands which decompose to braids. There would be two different braided variants of Galois groups. The Yangian of the affine Kac-Moody algebra could be seen as a 4-D generalization of the 2-D Kac-Moody algebra- that is a local algebra having representation as a power series of complex coordinates defined by the projections of the point of the space-time sheet to geodesic spheres of light-cone boundary and geodesic sphere of CP2. For the Yangian the generators would correspond to polynomials of the complex coordinate of string world sheet and for quantum affine algebra to Laurent series for the complex coordinate of partonic 2-surface. What the restriction to polynomials means is not quite clear. Witten sees Yangian as one half of Kac-Moody algebra containing only the generators having n≥ 0. This might mean that the positivity of conformal weight for physical states essential for the construction of the representations of Virasoro algebra would be replaced with automatic positivity of the conformal weight assignable to the Yangian coordinate. Also Virasoro algebra should be replaced with the Yangian of Virasoro algebra or its quantum counterpart. This construction should generalize also to Super Virasoro algebra. A generalization of conformal field theory to a theory defined at 4-D space-time surfaces using two preferred complex coordinates made possible by surface property is highly suggestive. The generalization of conformal field theory in question would have two complex coordinates and conformal invariance associated with both of them. This would therefore reduce the situation to effectively 2-dimensional one rather than 3-dimensional: this would be nothing but the effective 2-dimensionality of quantum TGD implied by the strong form of General Coordinate Invariance. This picture conforms with what the generalization of D=4 N=4 SYM by replacing point like particles with partonic 2-surfaces would suggest: Yangian is replaced with Yangian of quantum affine algebra rather than quantum group. Note that it is the finite measurement resolution alone which brings in the quantum parameters q1 and q2. The finite measurement resolution might be relevant for the elimination of IR divergences. How to construct the Yangian of quantum affine algebra? The next step is to try to understand the construction of the Yangian of quantum affine algebra. One starts with a given Lie group G. It could be the group of isometries of the imbedding space or subgroup of it or even the symplectic group of the light-like boundary of CD× CP2 and thus infinite-dimensional. It could be also the Lie group defining finite measurement resolution with the dimension of Cartan algebra determined by the number of braid strands. The next step is to construct the affine algebra (Kac-Moody type algebra with central extension). For the group defining the measurement resolution the scalar fields assigned with the ends of braid strands could define the Cartan algebra of Kac-Moody type algebra of this group. The ordered exponentials of these generators would define the charged generators of the affine algebra. For the imbedding space isometries and symplectic transformations the algebra would be obtained by localizing with respect to the internal coordinates of the partonic 2-surface. Note that also a localization with respect to the light-like coordinate of light-cone boundary or light-like orbit of partonic 2-surface is possible and is strongly suggested by the effective 2-dimensionality of light-like 3-surfaces allowing extension of conformal algebra by the dependence on second real coordinate. This second coordinate should obviously correspond to the restriction of second complex coordinate to light-like 3-surface. If the space-time sheets allow slicing by partonic 2-surfaces and string world sheets this localization is possible for all 2-D partonic slices of space-time surface. The next step is quantum deformation to quantum affine algebra with trigonometric R-matrix Rq1(u,v) associated with space-like braidings along space-like 3-surfaces along the ends of CD. u and v could correspond to the values of a preferred complex coordinate of the geodesic sphere of light-cone boundary defined by rotational symmetry. It choice would fix a preferred quantization axes for spin. The last step is the construction of Yangian using rational R-matrix Rq2(u,v). In this case the braiding is along the light-like orbit between ends of CD. u and v would correspond to the complex coordinates of the geodesic sphere of CP2. Now the preferred complex coordinate would fix the quantization axis of color isospin. These arguments are of course heuristic and do not satisfy any criteria of mathematical rigor and the details could of course change under closer scrutinity. The whole point is in the attempt to understand the situation physically in all its generality. The most important outcome is the conjecture that the incredibly powerful mathematical apparatus of 2-dimensional conformal field theories might have a generalization to four-dimensional context based on Yangians of quantum affined algebras. This might explain the miracles of both twistor approach and string approach. How 4-D generalization of conformal invariance relates to strong form of general coordinate invariance? The basic objections that one can rise to the extension of conformal field theory to 4-D context come from the successes of p-adic mass calculations. p-Adic thermodynamics relies heavily on the properties of partition functions for super-conformal representations. What happens when one replaces affine algebra with (quantum) Yangian of affine algebra? Ordinary Yangian involves the original algebra and its dual and from these higher multilocal generators are constructed. In the recent case the obvious interpretation for this would be that one has Kac-Moody type algebra with expansion with respect to complex coordinate w for partonic 2-surfaces and its dual algebra with expansion with respect to hyper-complex coordinate of string world sheet. p-Adic mass calculations suggest that the use of either algebra is enough to construct single particle states. Or more precisely, local generators are enough. I have indeed proposed that the multilocal generators are relevant for the construction of bound states. Also the strong form of general coordinate invariance implying strong form of holography, effective 2-dimensionality, electric-magnetic duality and S-duality suggest the same. If one could construct the states representing elementary particles solely in terms of either algebra, there would be no danger that the results of p-adic mass calculations are lost. Note that also the necessity to restrict the conformal weights of conformal representations to be non-negative would have nice interpretation in terms of the duality. For details and background the reader can consult either to the chapter Physics as Generalized Number Theory: Infinite Primes of "Physics as Generalized Number Theory", to the chapter Yangian Symmetry, Twistors, and TGD of "Towards M-matrix" or to the article Langlands conjectures in TGD framework. The first results about Lepton-Photon 2011 have appeared. Both Lubos and Phil show some plots ATLAS. Also CMS has given news release about Higgs search results in Lepton-Photon 2011 conference. The search of CMS involves decays of Higgs to pairs of photons, W bosons, or Z bosons or to tau lepton - or b quark pairs. The mass ranges 145-216 GeV, 226-288 GeV and 310-400 GeV for Higgs are excluded. Standard model Higgs boson is excluded in the range 144-440 GeV with 90 per cent confidence level. A modest excess of events is still observed below 145 GeV. The results are very similar to those of ATLAS. One can say that Higgs (or whatever it is) signal has weakened. Tommaso reports the results and gives a very interesting graph representing the observed and theoretical probability (p-value) that the data are compatible with the background (assuming of course that Higgs is there!) as function of Higgs mass. The theoretical p-value is much smaller than the observed. Around 145 GeV the p-value has however a downwards peak extending below 2 sigma (below than 10-2). The theoretical p-value is below 3 sigma and by more than order of magnitude smaller than the experimental value. Something might be there but it does not seem to be Higgs! If it is not the Higgs there are no problems since this something would be produced and decay with different rates. To state it again: the presence of a clear deviation which is too small for Higgs could be seen as a direct indication that something else than Higgs is there. That's it. Somewhat disappointingly, the situation remains still open. Recall that TGD predicts that all Higgs components become longitudinal polarizations of massless particles in massivation. Entire scaled up hadron physics would replace Higgs in TGD Universe and guarantee unitarity. The pion of M89 hadron physics should have mass not far from 145 GeV and the above discussed graph enhances the optimism of TGD phanatic;-). It is nice to see the pieces of the puzzle to find their place. In Quantum diaries of CERN there is an article What if it's not the Higgs? : maybe the title of the posting is inspired by some anticipation of the results represented by Tommaso. According to this article, the theories trying to explain matter antimatter asymmetry and produce quantum gravity have not been very successful. Typically they predict Higgs, Z' and (exotic) graviton decaying to b quark pair. Z' has appeared also as explanation of 145 GeV CDF bump (not seen by D0) about which everyone except me has been silent: the reason I cannot keep my mouth shut is that in TGD Universe the interpretation as M89 pion is natural and there are also indications for M89 ρ and ω with predicted masses. The decay characteristics distinguish between Higgs and Z' and also the decay to two gammas is something distinguishing pion like pseudoscalar state from Higgs. It seems that we must just patiently wait. Is quantal Boolean reverse engineering possible? The quantal version of Boolean algebra means that the basic logical functions have quantum inverses. The inverse of C=A ∧ B represents the quantum superposition of all pairs A and B for which A∧ B=C hols true. Same is true for ∨. How could these additional quantum logical functions with no classical counterparts extend the capacities of logician? What comes in mind is logical reverse engineering. Consider the standard problem solving situation repeatedly encountered by my hero Hercule Poirot. Someone has been murdered. Who could have done it? Who did it? Actually scientists who want to explain instead of just applying the method to get additional items to the CVC, meet this kind of problem repeatedly. One has something which looks like an experimental anomaly and one has to explain it. Is this anomaly genuine or is it due to a systematic error in the information processing? Could the interpretation of data be somehow wrong? Is the model behind experiments based on existing theory really correct or has something very delicate been neglected? If a genuine anomaly is in question (someone has been really murdered- this is always obvious in the tales about the deeds of Hercule Poirot since the mere presence of Hercule guarantees the murder unless it has been already done) one encounters what might be called Poirot problem in honor of my hero. As a matter fact, from the point of view of Boolean algebra, one has the same reverse Boolean engineering problem irrespective of whether it was a genuine anomaly or not. This brings in my mind the enormously simplified problem. The logical statement C is found to be true. Which pairs A,B could have implied C as C=A∧ B (or A∨ B). Of course, much more complex situations can be considered where C corresponds to some logical function C=f(A1,A2,...,An). Quantum Poirot could use quantum computer able to realize the co-gates for gates AND and OR (essentially time reversals) and write a quantum computer program solving the problem by constructing the Boolean co-function of Boolean function f.
What would happen in TGD Universe obeying zero energy ontology is following. The statement C is represented as as positive energy part of zero energy state (analogous to initial state of physical event) and A1,..An is represented as one state in the quantum superposition of final states representing various value combinations for A1,...,An. Zero energy states (rather than only their evolution) represets the arrow of time. The M-matrix characterizing time-like entanglement between positive and negative energy states generalizes generalizes S-matrix. S-matrix is such that initial states have well defined particle numbers and other quantum numbers whereas final states do not. They are analogous to the outcomes of quantum measurement in particle physics. Negentropy Maximization Principle maximizing the information contents of conscious experience (sic!) forces state function reduction to one particular A1,...,An and one particular value combination consistent with C is found in each state function reduction. At the ensemble level one obtains probabilities for various outcomes and the most probable combination might represent the most plausible candidate for the murderer in quantum Poirot problem. Also in particle physics one can only speak about plausibility of the explanation and this leads to the endless n sigma talk. Note that it is absolutely essential that state function reduction occurs. Ironically, quantum problem solving causes dissipation at the level of ensemble but the ensemble probabilities carry actually information! Second law of thermodynamics tells us that Nature is a pathological problem solver- just like my hero! In TGD framework basic logical binary operations have a representation at the level of Boolean algebra realized in terms of fermionic oscillator operators. They have also space-time correlates realized topologically. ∧ has a representation as the analog of three-vertex of Feynman graph for partonic 2-surfaces: partonic 2-surfaces are glued along the ends to form outgoing partonic 2-surface. ∨ has a representation as the analog of stringy trouser vertex in which partonic surfaces fuse together. Here TGD differs from string models in a profound manner. To conclude, I am a Boolean dilettante and know practically nothing about what quantum computer theorists have done- in particular I do not know whether they have considered quantum inverse gages. My feeling is that only the gates with bits replaced with qubits are considered: very natural when one thinks in terms of Boolean logic. If this is really the case, quantal co-AND and co-OR having no classical counterparts would bring a totally new aspect to quantum computation in solving problems in which one cannot do without (quantum) Poirot and his little gray (quantum) brain cells. For details and background the reader can consult either to the chapter Physics as Generalized Number Theory: Infinite Primes of "Physics as Generalized Number Theory" or to the article How infinite primes relate to other views about mathematical infinity?. Lepton Photon 2011 sumposium will be held at Tata Instutute of Fundamental Research in Mumbai, India. The event has been already noticed by Peter Woit and Lubos Motl . The symposium will begin at Monday morning with reports about Higgs search. Every particle physicist is of course eagerly waiting announcement: either about evidence for Higgs at some mass value in the interval 110-150 GeV or of total exclusion of Higgs in this range. 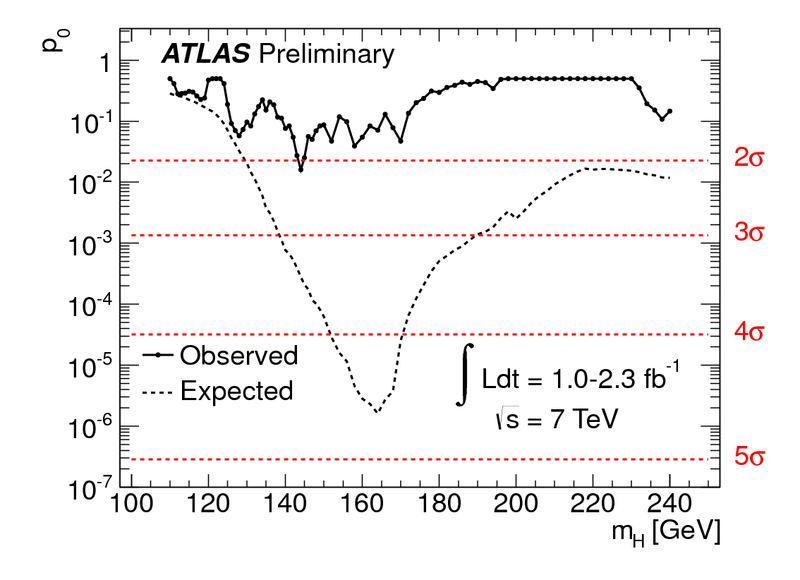 Fewer of us are waiting something around 145 GeV but not identifiable as Higgs;-). My own expectations are somewhat non-standard. As I have explained many times (see for instance this and this), TGD predicts that Higgs like particles exist but since all gauge bosons become massive all Higgs components are "eaten". This expectation can be motivated by simple twistorial considerations theoretically in zero energy ontology which in TGD framework replaces standard positive energy ontology. Also new view about Feynman diagrammatics based on geometrization of Feynman diagrams is involved. Something is needed to preserve the unitary of the theory and the 15-year old prediction of TGD is that instead of Higgs entire new hadron physics characterized by Mersenne prime M89 =289-1 replaces Higgs. p-Adic mass calculations lead to this prediction and predict that its mass scale is 512 times higher than that of ordinary hadron physics. The masses of hadrons of this physics cannot be predicted completely but very little additional information is needed to fix the masses. The 145 GeV bump reported by CDF (but not confirmed by D0) does not allow interpretation as Higgs and TGD based interpretation would be as the pion of M89 physics. This would allow to predict masses of M89 ρ and ω and there are in the first approximation identical and equal to 325 GeV. Evidences for bumps at these masses have been found. What is the experimental situation concerning Higgs? There is some statistical evidence for a bump in the interval 140-150 GeV discussed by Phil Gibbs and even rumors about bump around 144 GeV. It could be Higgs or something else. If the rumor has some truth in it, a lot of work is needed to check whether it is scalar, pseudo-scalar (as M89 pion would be), or something else. Suppose that they announce in Lepton-Photon 2011 that there is something consistent with Higgs at 144 GeV? What will happen? Those believing in Higgs will be happy for some time. It will probably take year or two to learn whether it was really Higgs or something else. What puts of course the bells ringing is that the mass corresponds to 145 GeV of CDF bump which did not allow identification as Higgs. Certainly CDF and D0 will compare their analysis carefully and certainly people will try to find explanation for the discrepancy. Maybe even explanations in terms of new physics might emerge. Pseudo scalar or scalar? : this will certainly be the crucial question. The decay to two monochromatic photons is a clear signature for pseudo-scalar and could finally demonstrate to me that a pion of M89 hadron physics is in question (colleagues of course would propose different explanations such as technicolor!). The tell-tale signature would the decay rate completely fixed from anomaly considerations and could allow to distinguish M89 pion from Higgs decaying also to two photons. Pseudo-scalar property predicts of course also other signatures for the distributions of decay products. Also evidence for other mesons such as ρ and ω will emerge if TGD is the correct theory. As already mentioned, for ρ and ω of M89 hadron physics indications already exist and their masses are predicted correctly by TGD assuming 145 GeV mass for M89 pion. I dare to to speculate that if Higgs leaves, nothing can prevent p-adic physics from creeping in. Some-one has said that when the time is ripe for a new idea, nothing can prevent its breakthrough. As a matter fact, it is difficult to believe that after 16 years from the first variant of p-adic mass calculations predicting correctly the masses of known particles, predicting a lot of new physics, and even stored in arXiv (still possible at that time!) colleagues are still wasting their time by studying extremely complex variants of Higgs mechanism with no hope about what might be called understanding. This represents an extreme example about the power of social pressures even in science. Somehow the healthy skepticism has turned into conformism freezing all progress. Be as it may, I think that many colleagues share with me the belief that these years will be a critical period which can profoundly modify the fundamentals of theoretical physics. My hope of course is that my life work will turn out to be the theory- not for personal vanity but because it would mean profound modifications of the existing world view: most importantly of the ideas about life and consciousness. These consequences would be far more important than the implications for particle physics. I discussed in the previous posting the TGD based vision about Langlands program. I have actually written several postings related to the relation ship between TGD and physical mathematics during this year (see this, this, this, this, this, this, this, this, this, this, this, this, this, this, this, this, and this). I try also to become (and remain!) conscious about possible sources of inconsistencies to see what might go wrong. I see the attempt to understand the relation between Langlands program and TGD as a part of a bigger project the goal of which is to relate TGD to physical mathematics. The basic motivations come from the mathematical challenges of TGD and from the almost-belief that the beautiful mathematical structures of the contemporary physical mathematics must be realized in Nature somehow. The notion of infinite prime is becoming more and more important concept of quantum TGD and also a common denominator. The infinite-dimensional symplectic group acting as the isometry group of WCW geometry and symplectic flows seems to be another common denominator. Zero energy ontology together with the notion of causal diamond is also a central concept. A further common denominator seems to be the notion of finite measurement resolution allowing discretization. Strings and super-symmetry so beautiful notions that it is difficult to imagine physics without them although super string theory has turned out to be a disappointment in this respect. In the following I mention just some examples of problems that I have discussed during this year. Infinite primes are certainly something genuinely TGD inspired and it is reasonable to consider their possible role in physical mathematics. The set theoretic view about the fundamentals of mathematics is inspired by classical physics. Cantor's view about infinite ordinals relies on set theoretic representation of ordinals and is plagued by difficulties (say Russel's paradox) (see this). Infinite primes provide an alternative to Cantor's view about infinity based on divisility alone and allowing to avoid these problems. Infinite primes are obtained by a repeated second quantization of an arithmetic quantum field theory and can be seen as a notion inspired by quantum physics. The conjecture is that quantum states in TGD Universe can be labelled by infinite primes and that standard model symmetries can be understood in terms of octonionic infinite primes defined in appropriate manner. The replacement of ordinals with infinite primes would mean a modification of the fundamentals of physical mathematics. The physicists's view about the notion set is also much more restricted than the set theoretic view. Subsets are typically manifolds or even algebraic varieties and they allow description in terms of partial differential equations or algebraic equations. Boolean algebra is the quintessence of mathematical logic and TGD suggests that quantum Boolean algebra should replace Boolean algebra (see this). The representation would be in terms of fermionic Fock states and in zero energy ontology fermionic parts of the state would define Boolean states of form A→ B. This notion might be useful for understanding the physical correlates of Boolean cognition and might also provide insights about fundamentals of physical mathematics itself. Boolean cognition must have space-time correlates and this leads to a space-time description of logical OR resp. AND as a generalization of trouser diagram of string models resp. fusion along ends of partonic 2-surfaces generalizing the 3-vertex of Feyman diagrammatics. These diagrams would give rise to fundamental logic gates. Infinite primes can be represented using polynomials of several variables with rational coefficients (see this). One can solve the zeros of these polynomials iteratively. At each step one can identify a finite Galois group permuting the roots of the polynomial (algebraic function in general). The resulting Galois groups can be arranged into a hierarchy of Galois groups and the natural idea is that the Galois groups at the upper levels act as homomorphisms of Galois groups at lower levels. A generalization of homology and cohomology theories to their non-Abelian counterparts emerges (see this): the square of the boundary operation yields unit element in normal homology but now an element in commutator group so that abelianization yields ordinary homology. The proposal is that the roots are represented as punctures of the partonic 2-surfaces and that braids represent symplectic flows representing the braided counterpars of the Galois groups. Braids of braids of.... braids structrure of braids is inherited from the hierarchical structure of infinite primes. That braided Galois groups would have a representation as symplectic flows is exactly what physics as generalized number theory vision suggests and is applied also to understand Langlands conjectures. Langlands program would be modified in TGD framework to the study of the complexes of Galois groups associated with infinite primes and integers and have direct physical meaning. The notion of finite measurement resolution realized at quantum level as inclusions of hyper-finite factors and at space-time level in terms of braids replacing the orbits of partonic 2-surfaces - is also a purely TGD inspired notion and gives good hopes about calculable theory. The notion of finite measurement resolution leads to a rational discretization needed by both the number theoretic and geometric Langlands conjecture. The simplest manner to understand the discretization is in terms of extrema of Chern-Simons action if they correspond to "rational" surfaces. The guess that the rational surfaces are dense in the WCW just as rationals are dense in various number fields is probably quite too optimistic physically. Algebraic partonic 2-surfaces containin typically finite number of rational points having interpretation in terms of finite measurement resolution. Same might apply to algebraic surfaces as points of WCW in given quantum state. The charged generators of the Kac-Moody algebra associated with the Lie group G defining measurement resolution correspond to tachyonic momenta in free field reprsesentation using ordered exponentials. This raises unpleasant question. One should have also a realization for the coset construction in which Kac-Moody variant of the symplectic group of δ M4+/- and Kac-Moody algebra of isometry group of H assignable to the light-like 3-surfaces (isometries at the level of WCW resp. H) define a coset representation. Equivalence Principle generalizes to the condition that the actions of corresponding super Virasoro algebras are identical. Now the momenta are however non-tachyonic. How these Kac-Moody type algebras relate? From p-adic mass calculations it is clear that the ground states of super-conformal representations have tachyonic conformal weights. Does this mean that the ground states can be organized into representations of the Kac-Moody algebra representing finite measurement resolution? Or are the two Kac-Moody algebra like structures completely independent. This would mean that the positions of punctures cannot correspond to the H-coordinates appearing as arguments of sympletic and Kac-Moody algebra giving rise to Equivalence Principle. The fact that the groups associated with algebras are different would allow this. TGD is a generalization of string models obtained by replacing strings with 3-surfaces. Therefore it is not surprising that stringy structures should appear also in TGD Universe and the strong form of general coordinate invariance indeed implies this. As a matter fact, string like objects appear also in various applications of TGD: consider only the notions of cosmic string (see this) and nuclear string (see this). Magnetic flux tubes central in TGD inspired quantum biology making possible topological quantum computation (see this) represent a further example. What distinguishes TGD approach from Witten's approach is that twisted SUSY is replaced by string model like theory with strings moving in the moduli space for partonic 2-surfaces or string world sheets related by electric-magnetic duality. Higgs bundle is replaced with the moduli space for punctured partonic 2-surfaces and its electric dual for string world sheets. The new element is the possibility of trouser vertices and generalization of 3-vertex if Feynman diagrams having interpretation in terms of quantum Boolean algebra. Stringy view means that all topologies of partonic 2-surfaces are allowed and that also quantum superpositions of different topologies are allowed. The restriction to single topology and fixed moduli would mean sigma model. Stringy picture requires quantum superposition of different moduli and genera and this is what one expects on physical grounds. The model for CKM mixing indeed assumes that CKM mixing results from different topological mixings for U and D type quarks (see this) and leads to the notion of elementary particle vacuum functional identifiable as a particular automorphic form (see this). The twisted variant of N=4 SUSY appears as TQFT in many mathematical applications proposed by Witten and is replaced in TGD framework by the stringy picture. Supersymmetry would naturally correspond to the fermionic oscillator operator algebra assignable to the partonic 2-surfaces or string world sheet and SUSY would be broken. When I look what I have written about various topics during this year I find that symplectic invariance and symplectic flows appear repeatedly. Khovanov homology provides very general knot invariants. I rephrased Witten's formulation about Khovanov homology as TQFT in TGD framework here. Witten's TQFT is obtained by twisting a 4-dimensional N=4 SYM. This approach generalizes the original 3-D Chern-Simons approach of Witten. Witten applies twisted 4-D N=4 SYM also to geometric Langlands program and to Floer homology. TGD is an almost topological QFT so that the natural expectation is that it yields as a side product knot invariants, invariants for braiding of knots, and perhaps even invariants for 2-knots: here the dimension D=4 for space-time surface is crucial. One outcome is a generalization of the notion of Wilson loop to its 2-D variant defined by string world sheetw and a unique identification of string world sheet for a given space-time surface. The duality between the descriptions based on string world sheets and partonic 2-surfaces is central. I have not yet discussed the implications of the conjectures inpired by Langlands program for the TGD inspired view about knots. Floer homology generalizes the usual Morse theory and is one of the applications of topological QFTs discussed by Witten using twisted SYM. One studies symplectic flows and the basic objects are what might regarded as string world sheets referred to as pseudo-holomorphic surfaces. It is now wonder that also here TGD as almost topological QFT view leads to a generalization of the QFT vision about Floer homology (see this). The new result from TGD point of view was the realization that the naivest possible interpretation for Kähler action for a preferred extremal is correct. The contribution to Kähler action from Minkowskian regions of space-time surface is imaginary and has identification as Morse function whereas Euclidian regions give the real contribution having interpretation as Kähler function. Both contributions reduce to 3-D Chern-Simons terms and under certain additional assumptions only the wormhole throats at which the signature of the induced metric changes from Minkowskian to Euclidian contribute. Gromov-Witten invariants are closely related to Floer homology and their definition involves quantum cohomology in which the notion of intersection for two varieties is more general taking into account "quantum fuzzines". The stringy trouser vertex represent the basic diagram: the incoming string world sheets intersect because they can fuse to single string world sheet. Amazingy, this is just that OR in quantum Boolean algebra suggested by TGD. Another diagram would be AND responsible for genuine particle reactions in TGD framework. There would be a direct connection with quantum Boolean algebra. Number theoretical universality is one of the corner stones of the vision about physics as generalized number theory. One might perhaps say that a similar vision has guided Grothendieck and his followers. The realization of this vision involves several challenges. One of them is definition of p-adic integration. At least integration in the sense of comology is needed and one might also hope that numerical approach to integration exists. It came as a surprise to me that something very similar to number theoretical universality has inspired also mathematicians and that there exist refined theories inspired by the notion of motive introduced by Groethendieck to define universal cohomology applying in all number fields. One application and also motivation for taking motives very seriously is notivic integration which has found applications in in physics as a manner to calculate twistor space integrals defining scattering amplitudes in twistor approach to N=4 SUSY. The essence of motivic integral is that integral is an algebraic operation rather than defined by a measure. One ends up with notions like scissor group and integration as processing of symbols. This is of course in spirit with number theoretical approach where integral as measure is replaced with algebraic operation. The problem is that numerics made possible by measure seems to be lost. The TGD inspired proposal for the definition of p-adic integral relies on number theoretical universality reducing the integral essentially to integral in the rational intersection of real and p-adic worlds. An essential role is played at the level of WCW by the decomposition of WCW to a union of symmetric spaces allowing to define what the p-adic variant of WCW is. Also this would conform with the vision that infinite-dimensional geometric existence is unique just from the requirement that it exists. One can consider also the possibility of having p-adic variant of numerical integration (see this). Twistor approach has led to the emergence of motives to physics and twistor approach is also what gives hopes that some day quantum TGD could be formulated in terms of explicit Feynman rules or their twistorial generalization (see this and this). The Yangian symmetry discovered first in integrable quantum theories is responsible for the success fo the twistorial approach. What distinguishes Yangian symmetry from standard symmetries is that the generators of Lie algebra are multilocal. Yangian symmetry is generalized in TGD framework since point like particles are replaced by partonic 2-surfaces meaning that Lie group is replaced with Kac-Moody group or its generalization. Finite measurement resolution however replaces them with discrete set of points definining braid strands so that a close connection with twistor approach and ordinary Yangian symmetry is suggestive in finite measurement resolution. Also the fact that Yangian symmetry relates closely to topological string models supports the expectation that the proposed stringy view about quantum TGD could allow to formulate twistorial approach to TGD. The vision about finite measurement resolution represented in terms of effective Kac-Moody algebra defined by a group with dimension of Cartan algebra given by the number of braid strands must be consistent with the twistorial picture based on Yangians and this requires extension to Yangian algebra. In Yangian picture one cannot speak about single partonic 2-surface alone and the same is true about the TGD based generalization of Langlands probram. Collections of two-surfaces and possibly also string world sheets are always involved. Multilocality is also required by the basic properties of quantum states in zero energy ontology. The Kac-Moody group extended to Yangian and defining finite measurement resolution would naturally correspond to the gauge group of N=4 SUSY and braid points to the arguments of N-point functions. The new element would be representation of massive particles as bound states of massles particles giving hopes about cancellation of IR divergences and about exact Yangian symmetry. Second new element would be that virtual particles correspond to wormholes for which throats are massless but can have different momenta and opposite signs of energies. This implies that absence of UV divergences and gives hopes that the number of Feynman diagrams is effectively finite and that there is simple expression of twistorial diagrams in terms of Feynman diagrams (see this). For details and background the reader can consult either to the chapter Langlands Program and TGD of "Physics as Generalized Number Theory" or to the articles Langlands Conjectures in TGD Framework, How infinite primes relate to other views about mathematical infinity?, Motives and Infinite primes, and Could one generalize braid invariant defined by vacuum expectation of Wilson loop to an invariant of braid cobordisms and of 2-knots?. Also the previous blog postings during this year give a view about the development of ideas. During last years I have done work in attempt to relate TGD to the new developments in mathematics. The evolution of ideas has been especially fast during last year and I have reported about these developments in various postings. The latest articles are How infinite primes relate to other views about mathematical infinity? and Motives and Infinite Primes. What makes me happy is that TGD is not only receiving experimental support from LHC and other particle accelerators but also providing profound insights inspiring mathematical conjectures. What is also highly satisfying that the physically motivated visions such as the need for number theoretic universality are guiding the development of modern mathematics. The notion of motives introduced by Grothendieck is a good example about number theoretical universality and relates to the need to define integral- at least in cohomological sense- for all number fields: very concrete challenge also in TGD framework. Langlands program is one of the hot areas of what might be called physical mathematics. The above mentioned number theoretical universality is one of the guiding lines in this approach. The program relies on very general conjectures about a connection between number theory and harmonic analysis relating the representations of Galois groups with the representations of certain kinds of Lie groups to each other. Langlands conjecture has many forms and it is indeed a conjecture and many of them are inprecise since the notions involved are not sharply defined. Peter Woit noticed that Ed Frenkel had given a talk with rather interesting title "What do Fermat's Last Theorem and Electro-magnetic Duality Have in Common?"? I listened the talk and found it very inspiring. The talk provides bird's eye of view about some basic aspects of Langlands program using the language understood by physicist. Also the ideas concerting the connection between Langlands duality and electric-magnetic duality generalized to S-duality in the context of non-Abelian gauge theories and string theory context and developed by Witten and Kapustin and followers are summarized. In this context D=4 and twisted version of N=4 SYM familiar from twistor program and defining a topological QFT appears. For some years ago I made my first attempt to understand what Langlands program is about and tried to relate it to TGD framework (see this). At that time I did not really understand the motivations for many of the mathematical structures introduced. In particular, I did not really understand the motivations for introducing the gigantic Galois group of algebraic numbers regarded as algebraic extension of rationals. Why not restrict the consideration to finite Galois groups or their braided counterparts (as I indeed effectively did in my first approach)? At that time I concentrated on the question what enormous Galois group of algebraic numbers regarded as algebraic extension of rationals could mean, and proposed that it could be identified as a symmetric group consisting of permutations of infinitely many objects. The definition of this group is however far from trivial. Should one allow as generators of the group only the permutations affecting only finite number of objects or permutations of even infinite number of objects? The analogous situation for the sequences of binary digits would lead to a countable set of sequence of binary digits forming a discrete set of finite integers in real sense or to 2-adic integers forming a 2-adic continuum. Something similar could be expected now. The physical constraints coming the condition that the elements of symmetric group allow lifting to braidings suggested that the permutations permuting infinitely many objects should be periodic meaning that the infinite braid decomposes to an infinite number of identical N-braids and braiding is same for all of them. The p-adic analog would be p-adic integers, which correspond to rationals having periodical expansion in powers of p. Braids would be therefore like pinary digits. I regarded this choice as the most realistic one at that time. I failed to realize the possibility of having analogs of p-adic integers by general permutations. In any case, this observation makes clear that the unrestricted Galois group is analogous to a Lie group in topology analogous to p-adic topology rather than to discrete group. Neither did I realize that the Galois groups could be finite and be associated with some other field than rationals, say a Galois group associated with the field of polynomials of n-variable with rational coefficients and with its completion with coefficients replaced by algebraic numbers. The ring of adeles can be seen as a Cartesian product of non-vanishing real numbers R× with the infinite Cartesian product ∏ Zp having as factors p-adic integers Zp for all values of prime p. Rational adeles are obtained by replacing R with rationals Q and requiring that multiplication of rational by integers is equivalent with multiplication of any Zp with rational. Finite number of factors in Zp can correspond to Qp: this is required in to have finite adelic norm defined as the product of p-adic norms. This definition implicitly regards rationals as common to all number fields involved. At the first encounter with adeles I did not realize that this definition is in spirit with the basic vision of TGD. The motivation for the introduction of adele is that one can elegantly combine the algebraic groups assignable to rationals (or their extensions) and all p-adic number fields or even more general function fields such as polynomials with some number of argument at the same time as a Cartesian product of these groups as well as to finite fields. This is indeed needed if one wants to realize number theoretic universality which is basic vision behind physics as generalized number theory vision. This approach obviously means enormous economy of thought irrespective of whether one takes adeles seriously as a physicist. The talk of Frenkel inspired me to look again for Langlands program in TGD framework taking into the account of various developments that have occured in TGD during these years. I realized again that ideas develop unconsciously during the years and that many questions which remained unanswered for some years ago had found obvious answers. Instead of writing a 10 page posting I attach the abstract of pdf article "Langlands conjectures in TGD framework" at my homepage. The arguments of this article support the view that in TGD Universe number theoretic and geometric Langlands conjectures could be understood very naturally. The basic notions are following. Zero energy ontology and the related notion of causal diamond CD (CD is short hand for the cartesian product of causal diamond of M4 and of CP2). This notion leads to the notion of partonic 2-surfaces at the light-like boundaries of CD and to the notion of string world sheet. Electric-magnetic duality realized in terms of string world sheets and partonic 2-surfaces. The group G and its Langlands dual LG would correspond to the time-like and space-like braidings. Duality predicts that the moduli space of string world sheets is very closely related to that for the partonic 2-surfaces. The strong form of 4-D general coordinate invariance implying electric-magnetic duality and S-duality as well as strong form of holography indeed predicts that the collection of string world sheets is fixed once the collection of partonic 2-surfaces at light-like boundaries of CD and its sub-CDs is known. The proposal is that finite measurement resolution is realized in terms of inclusions of hyperfinite factors of type II1 at quantum level and represented in terms of confining effective gauge group (see this). This effective gauge group could be some associate of G: gauge group, Kac-Moody group or its quantum counterpart, or so called twisted quantum Yangian strongly suggested by twistor considerations ("symmetry group" hitherto). At space-time level the finite measurement resolution would be represented in terms of braids at space-time level which come in two varieties correspond to braids assignable to space-like surfaces at the two light-like boundaries of CD and with light-like 3-surfaces at which the signature of the induced metric changes and which are identified as orbits of partonic 2-surfaces connecting the future and past boundaries of CDs. There are several steps leading from G to its twisted quantum Yangian. The first step replaces point like particles with partonic 2-surfaces: this brings in Kac-Moody character. The second step brings in finite measurement resolution meaning that Kac-Moody type algebra is replaced with its quantum version. The third step brings in zero energy ontology: one cannot treat single partonic surface or string world sheet as independent unit: always the collection of partonic 2-surfaces and corresponding string worlds sheets defines the geometric structure so that multilocality and therefore quantum Yangian algebra with multilocal generators is unavoidable. In finite measurement resolution geometric Langlands duality and number theoretic Langlands duality are very closely related since partonic 2-surface is effectively replaced with the punctures representing the ends of braid strands and the orbit of this set under a discrete subgroup of G defines effectively a collection of "rational" 2-surfaces. The number of the "rational" surfaces in geometric Langlands conjecture replaces the number of rational points of partonic 2-surface in its number theoretic variant. The ability to compute both these numbers is very relevant for quantum TGD. The natural identification of the associate of G is as quantum Yangian of Kac-Moody type group associated with Minkowskian open string model assignable to string world sheet representing a string moving in the moduli space of partonic 2-surface. The dual group corresponds to Euclidian string model with partonic 2-surface representing string orbit in the moduli space of the string world sheets. The Kac-Moody algebra assigned with simply laced G is obtained using the standard tachyonic free field representation obtained as ordered exponentials of Cartan algebra generators identified as transversal parts of M4 coordinates for the braid strands. Langlands duality involves besides harmonic analysis side also the number theoretic side. Galois groups (collections of them) defined by infinite primes and integers having representation as symplectic flows defining braidings. I have earlier proposed that the hierarchy of these Galois groups define what might be regarded as a non-commutative homology and cohomology. Also the effective symmetry group has this kind of representation which explains why the representations of these two kinds of groups are so intimately related. This relationship could be seen as a generalization of the MacKay correspondence between finite subgroups of SU(2) and simply laced Lie groups. The symplectic group of the light-cone boundary acting as isometries of the WCW geometry allowing to represent projectively both Galois groups and effective symmetry groups as symplectic flows so that the non-commutative cohomology would have braided representation. This leads to braided counterparts for both Galois group and effective symetry group. The moduli space for Higgs bundle playing central role in the approach of Witten and Kapustin to geometric Landlands program is in TGD framework replaced with the conformal moduli space for partonic 2-surfaces. It is not however possible to speak about Higgs field although moduli defined the analog of Higgs vacuum expectation value. Note that in TGD Universe the most natural assumption is that all Higgs like states are "eaten" by gauge bosons so that also photon and gluons become massive. This mechanism would be very general and mean that massless representations of Poincare group organize to massive ones via the formation of bound states. It might be however possible to see the contribution of p-adic thermodynamics depending on genus as analogous to Higgs contribution since the conformal moduli are analogous to vacuum expectation of Higgs field. For details and background the reader can consult either to the chapter Langlands Program and TGD of "Physics as Generalized Number Theory" or to the article Langlands Conjectures in TGD Framework. Quantum Boolean algebra instead of Boolean algebra? Mathematical logic relies on the notion of Boolean algebra, which has a well-known representation as the algebra of sets which in turn has in algebraic geometry a representation in terms of algebraic varieties. This is not however attractive at space-time level since the dimension of the algebraic variety is different for the intersection resp. union representing AND resp. OR so that only only finite number of ANDs can appear in the Boolean function. TGD inspired interpretation of the fermionic sector of the theory in terms of Boolean algebra inspires more concrete ideas about the the realization of Boolean algebra at both quantum level and classical space-time level and also suggests a geometric realization of the basic logical functions respecting the dimension of the representative objects. In TGD framework WCW spinors correspond to fermionic Fock states and an attractive interpretation for the basis of fermionic Fock states is as Boolean algebra. In zero energy ontology one consider pairs of positive and negative energy states and zero energy states could be seen as physical correlates for statements A→ B or A↔ B with individual state pairs in the quantum superposition representing various instances of the rule A→ B or A↔ B. The breaking of time reversal invariance means that either the positive or negative energy part of the state (but not both) can correspond to a state with precisely definine number of particles with precisely defining quantum numbers such as four-momentum. At the second end one has scattered state which is a superposition of this kind of many-particle states. This would suggest that A→ B is the correct interpretation. In quantum group theory the notion of co-algebra is very natural and the binary algebraic operations of co-algebra are in a well-defined sense time reversals of those of algebra. Hence there is a great temptation to generalize Boolean algebra to include its co-algebra so that one might speak about quantum Boolean algebra. The vertices of generalized Feynman diagrams represent two topological binary operations for partonic two surfaces and there is a strong temptation to interpret them as representations for the operations of Boolean algebra and its co-algebra. The first vertex corresponds to the analog of a stringy trouser diagram in which partonic 2-surface decays to two and the reversal of this representing fusion of partonic 2-surfaces. In TGD framework this diagram does not represent classically particle decay or fusion but the propagation of particle along two paths after the decay or the reversal of this process. The Boolean analog would be logical OR (A&vee;B) or set theoretical union A∪B resp. its co-operation. The partonic two surfaces would represent the arguments (resp. co-arguments) A and B. Second one corresponds to the analog of 3-vertex for Feynman diagram: the three 3-D "lines" of generalized Feynman diagram meet at the partonic 2-surface. This vertex (co-vertex) is the analog of Boolean AND (A&wedge;B) or intersection A∩B of two sets resp. its co-operation. I have already earlier ended up with the proposal that only three-vertices appear as fundamental vertices in quantum TGD (see this). The interpretation of generalized Feynman diagrams as a representation of quantum Boolean algebra would give a deeper meaning for this proposal. These vertices could therefore have interpretation as a space-time representation for operations of Boolean algebra and its co-algebra so that the space-time surfaces could serve as classical correlates for the generalized Boolean functions defined by generalized Feynman diagrams and expressible in terms of basic operations of the quantum Boolean algebra. For this representation the dimension of the variety representing the value of Boolean function at classical level is the same as as the dimension of arguments: that is two. Hence this representation is not equivalent with the representation provided by algebraic geometry for which the dimension of the geometric variety representing A&wedge; B and A&vee; B in general differs from that for A and B. If one however restricts the algebra to that assignable to braid strands, statements would correspond to points at partonic level, so that one would have discrete sets and the set theoretic representation of quantum Boolean algebra could make sense. Discrete sets are indeed the only possibility since otherwise the dimension of intersection and union are different if algebraic varieties are in question. The breaking of time reversal invariance is accompanied by a generation of entropy and loss of information. The interpretation at the level of quantum Boolean algebra would be following. The Boolean function and and OR assign to two statements a single statement: this means a gain of information and at the level of physics this is indeed the case since entropy is reduced in the process reducing the number of particles. The occurrence of co-operations of AND and OR corresponds to particle decays and uncertainty about the path along which particle travels (dispersion of wave packet) and therefore loss of information. The "most logical" interpretation for the situation is in conflict with the identification of the arrow of logic implication with the arrow of time: the direction of Boolean implication arrow and the arrow of geometric time would be opposite so that final state could be said to imply the initial state. The arrow of time would weaken logical equivalence to implication arrow. If one naively identifies the arrows of logical implication and geometric time so that initial state can be said to imply the final state, second law implies that logic becomes fuzzy. Second law would weak logical equivalence to statistical implication arrow. The natural question is whether just the presence of both algebra and co-algebra operations causing a loss of information in generalized Feynman diagrams could lead to what might be called fuzzy Boolean functions expressing the presence of entropic element appears at the level of Boolean cognition. This picture requires a duality between Boolean algebra and its co-algebra and this duality would naturally correspond to time reversal. Skeptic can argue that there is no guarantee about the existence of the extended algebra analogous to Drinfeld double that would unify Boolean algebra and its dual. Only the physical intuition suggests its existence. These observations suggest that generalized Feynman diagrams and their space-time counterparts could have a precise interpretation in quantum Boolean algebra and that one should perhaps consider the extension of the mathematical logic to quantum logic. Alternatively, one could argue that quantum Boolean algebra is more like a model for what mathematical cognition could be in the real world.